Plans to relocate the Royal Marines Museum have been delayed for "at least two years" after a lottery grant of nearly £13m was refused. The museum in Eastney shut last year and was due to move to a new site in Portsmouth in 2020. However, the Heritage Lottery Fund (HLF) said it was unable to award money towards the relocation project, despite giving initial funding in 2016. 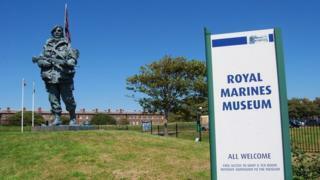 The National Museum of the Royal Navy (NMRN) called the rejection a "blow". NMRN, which incorporates several military museums, wants to move the Royal Marines collection from Eastney to Portsmouth's Historic Dockyard. After the grant rejection the reopening, which was scheduled for April 2020, would be "inevitably delayed, probably for at least two years", it said. The museum closed last year amid concerns about the building's "poor condition" and risk of exhibits being damaged. NWRN director general Prof Dominic Tweddle said the HLF had had to make "very hard decisions" after its funding landscape changed. In a statement, HLF said other projects had "more successfully demonstrated the case for investment and value for money". Revised designs for the new museum would cost £10m, according to Prof Tweddle. He said £3m had already been raised "independently" and a further £2m would come from the sale of the Eastney site.